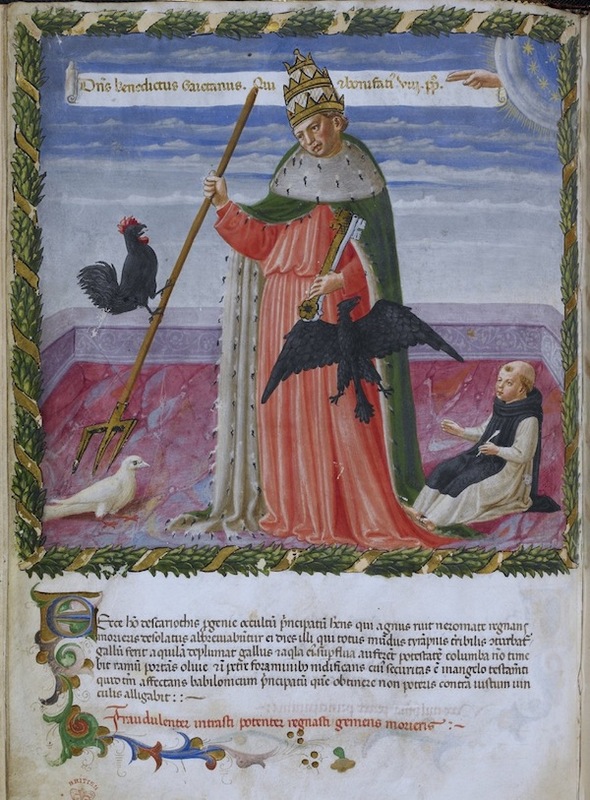 The mystical series of prophecies, known from their incipit as the Genus nequam prophecies (“the origin of evil”), are derived from the Byzantine Leo Oracles, a series of twelfth-century Byzantine prophecies that foretell a saviour-emperor destined to restore unity to the empire. 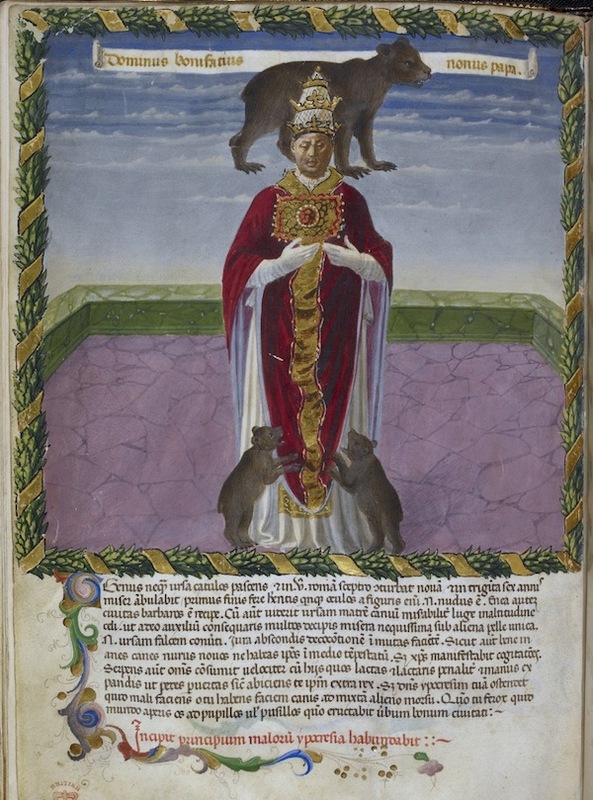 Their poems and tempera illuminations mix fantasy, the occult, and chronicle in a chronology of the popes. 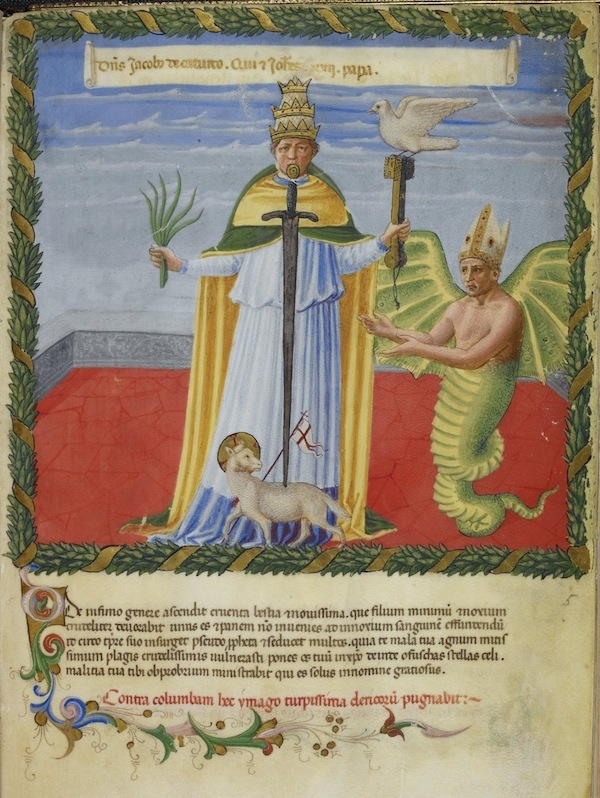 Each prophecy consists of four elements, an enigmatic allegorical text, an emblematic picture, a motto, and an attribution to a pope. 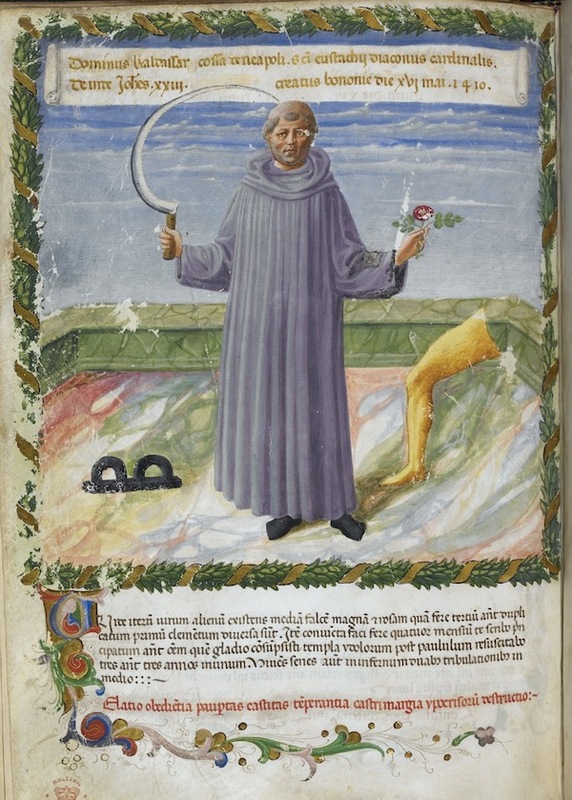 The series was augmented in the fourteenth century with further prophecies, with the incipit Ascende calve (“arise, bald one”), written in imitative continuation of the earlier set, but with more overtly propagandist aims. 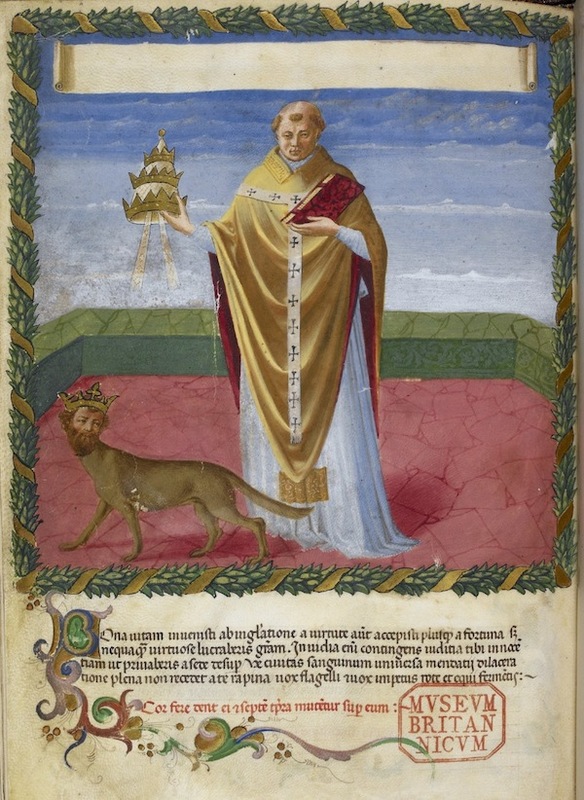 By the time of the Council of Constance (1414–1418), both series were united as the Vaticinia de summis pontificibus and misattributed to the Calabrian mystic Joachim of Flora, thus credited to a pseudo-Joachim. 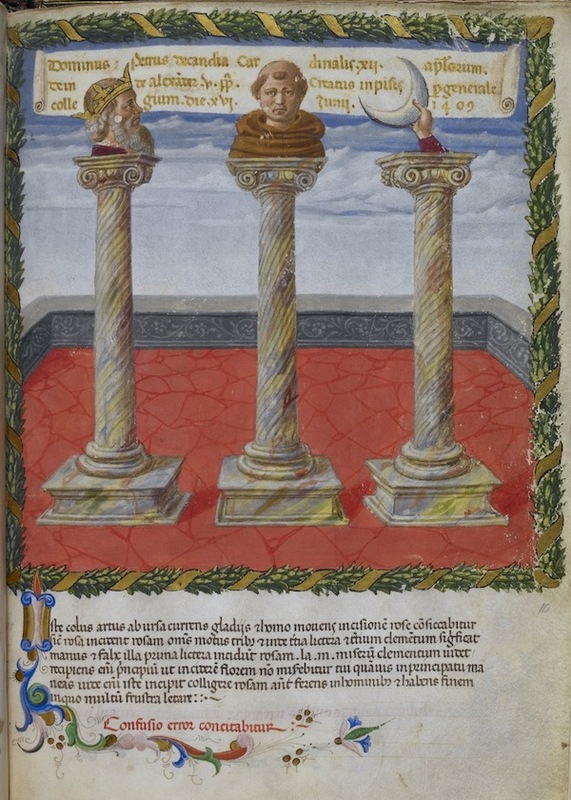 There are some fifty manuscripts of this fuller collection. 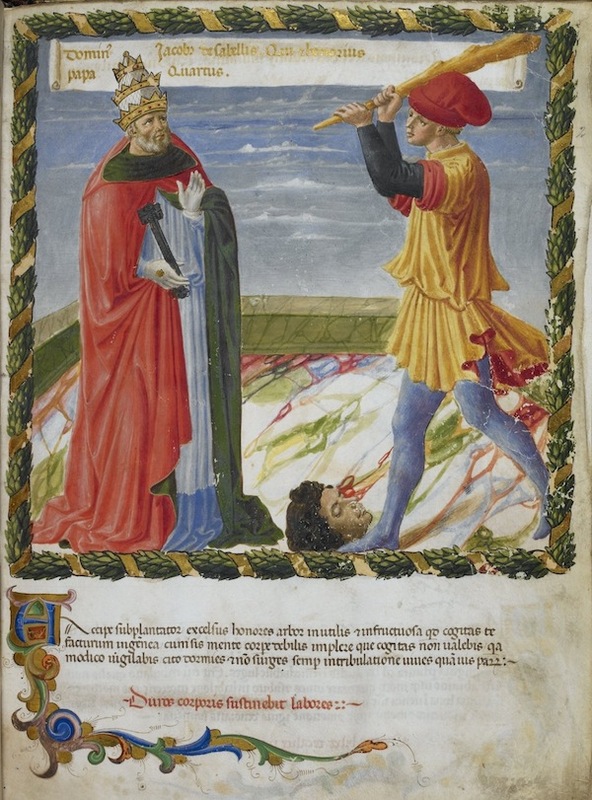 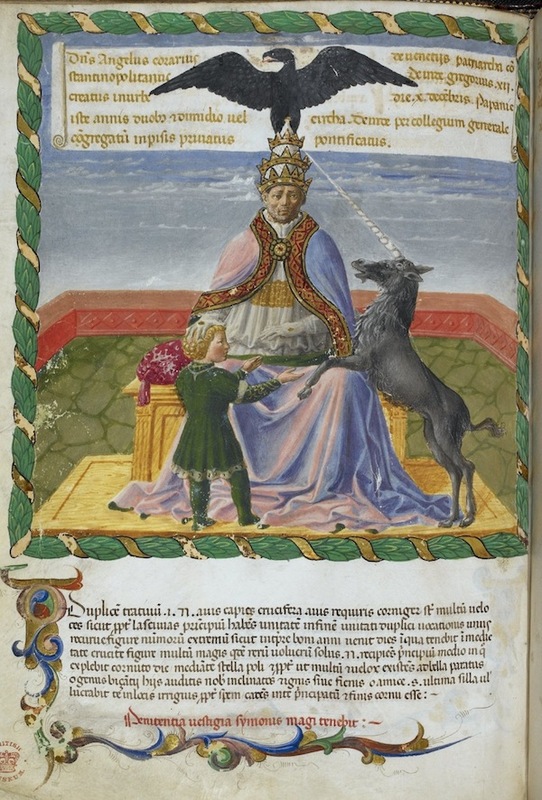 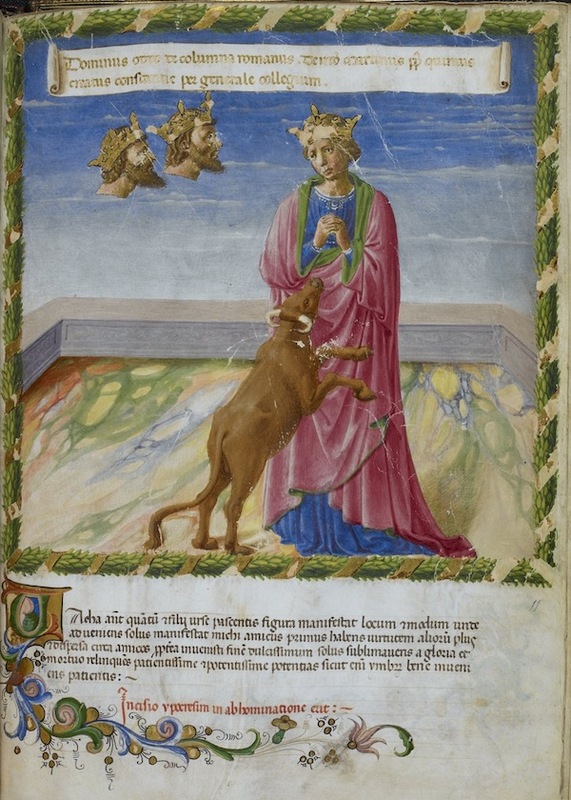 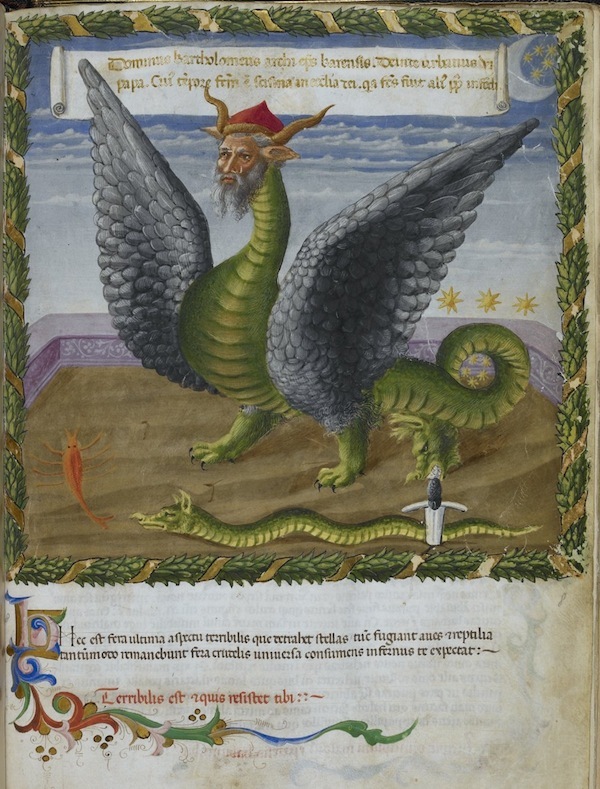 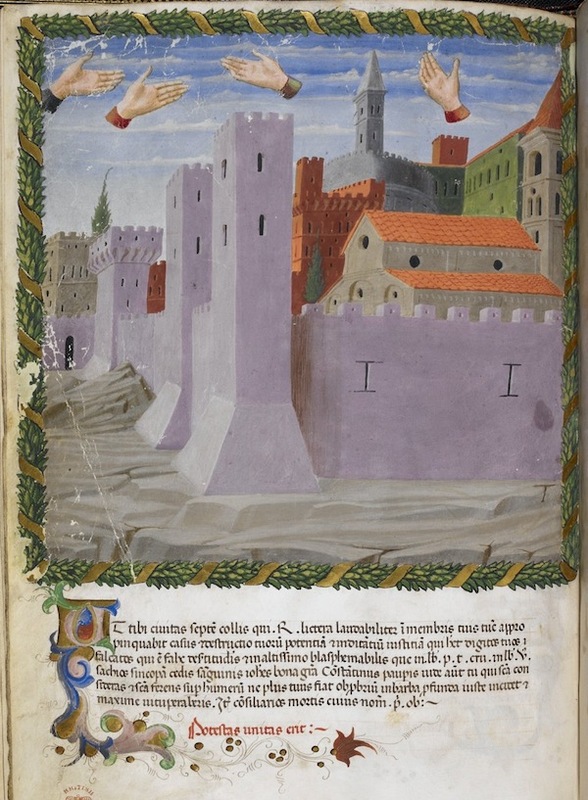 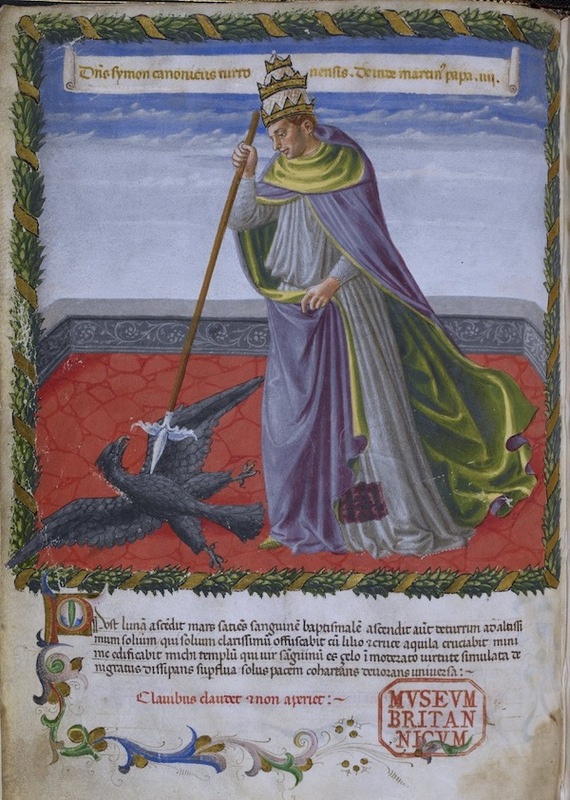 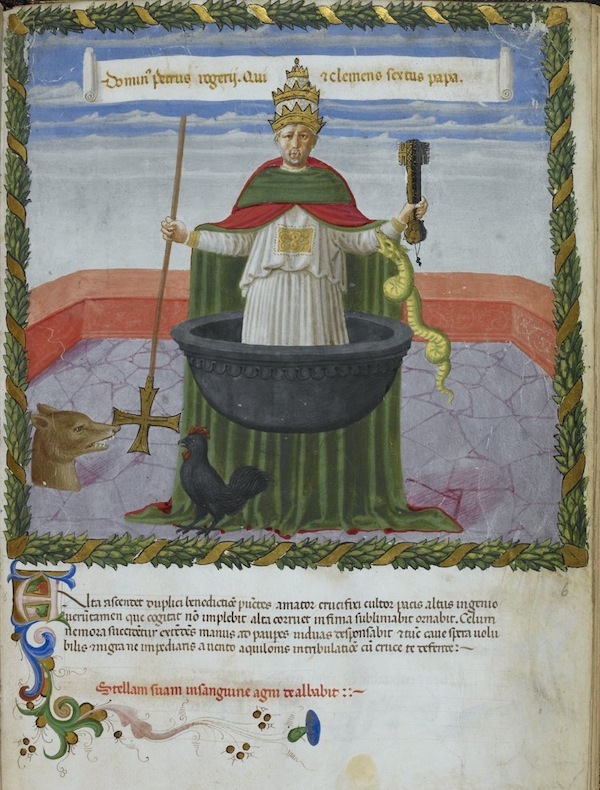 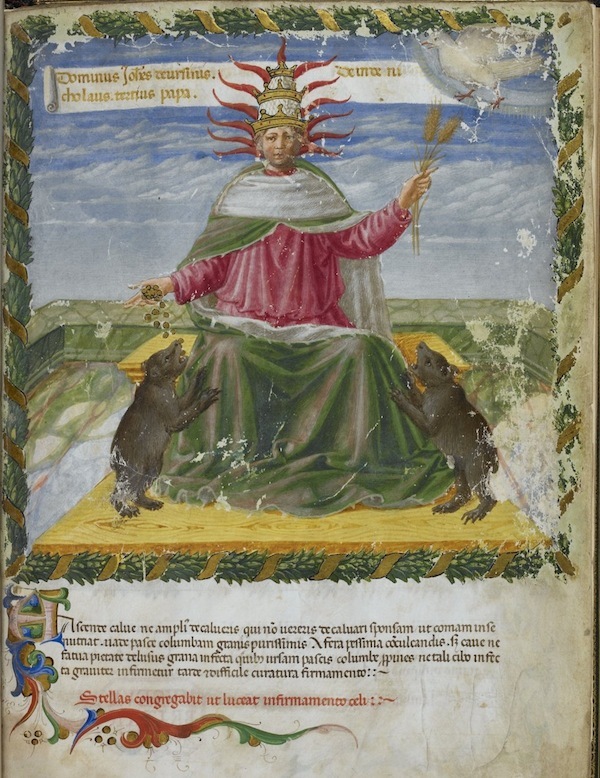 This particular version of the manuscript (catalogued in the British Library as Harley 1340) consists of 30 three-quarter page miniatures attributed by the art historian Bernard Berenson to the Master of San Miniato.